2008. 5 1/4" x 3 1/4". Edition of 15. Poem about finding, memory, and the shiny hope ahead. 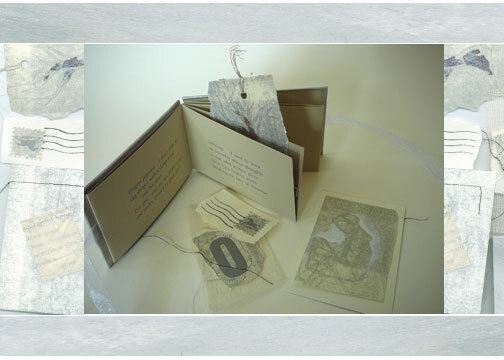 A folded book made from one piece of paper holds a pocket with imaginary silver ephemera: a stamp, a folded note, a bookmark, and other small works that might be found in a pocket at the end of the day. Painted paper covering boards, letterpress printing throughout. Twenty-fifth anniversary edition for never mind the press.